Chloé Pelle: "We want to keep our run going into this new series"
France may have reached the semi-finals in their last four global tournaments, but Chloé Pelle is quick to point out that they aren't satisfied yet with a maiden Cup title and qualification for the Tokyo 2020 Olympic Games the targets for this season. 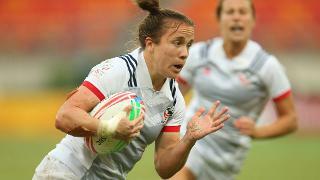 Chloé Pelle may not be able to put her fingers on the secret recipe behind France's emergence as a genuine title contender on the HSBC World Rugby Women's Sevens Series, but she has them crossed that it continues this weekend in the opening round of the 2019 series in Glendale, Colorado. France's run began with a first-ever series Cup final appearance in Kitakyushu in April, and while they may have lost 24-12 to a New Zealand side riding high after claiming an historic gold medal at the Commonwealth Games a week earlier, the seeds had been sown for a strong finish to the 2018 series. Kitakyushu was followed by semi-final appearances in the last two rounds of the series in Langford and on home soil in Paris as Les Bleues secured third place in the standings, their highest ranking and a big improvement on seventh the year before. But France weren't finished there and with confidence and belief high they went to Rugby World Cup Sevens 2018 in San Francisco and scored last-gasp tries to beat Canada and Olympic champions Australia to set up a rematch of the Kitakyushu final with defending champions New Zealand at AT&T Park. The outcome would be the same with New Zealand in no mood to relinquish their crown, racing away to a 29-0 victory, but France had again made people sit up and take notice of them. "I think it is time together," reasoned Pelle. "We have improved since we came into the series. We had a lot of new girls that came in and they adapted really well and maybe we have a little bit more confidence in ourselves now and that is what has helped. "We are quite close and we really get on well together, which is quite nice because we are like 24/7 with the group! It is nice to have a bond, everyone is saying that rugby is like a second family and it is kind of true, like cousins or sisters. "The fact that we are actually professional, of course, helps a lot because we can train more together. We have a game that we need to know the girl that stands next to you and how she plays to be able to play with her. It helps a lot to keep on playing with the same girls. "We are excited about the new series, after the World Cup we want to keep going like this and there is Olympic qualification at the end of the year too so we want to start the series well to be able to qualified and be done with it!" France were the higher ranked of the five European core teams last season and Pelle knows that if they miss out on a top four position in this series then the road to Tokyo 2020 will become much harder as they would have to win the Rugby Europe qualifier next year or the Olympic repechage to book their ticket to Japan. "In Europe there is England, Ireland, Russia and Spain with France in the world series. That is a lot and so if we can to qualify as soon as possible it will be best and then we can focus on the Olympics and train for it. "There is, of course, a little bit of pressure to finish in the top four, but we know that we are capable of doing this, so we will really try to focus on our game because if we play the game we are able to play we know we can qualify. "If you think about it too much you become stressed. We just want to play our game and if everything goes well and we play our game we will qualify. "A good start is important because on the series if you do well and are in the top three you head the pool (for the next round) and it is easier for us. If you start well it is easier to finish well than if you start badly and then have to find a way back into the top three." Could the HSBC USA Women's Sevens, where France will play Canada, Fiji and Ireland in Pool C at Infinity Park, yield a first title for Les Bleues this weekend? "We will certainly try for that to happen!" laughed the 28-year-old. "We will try for that to happen but we will see. I hope this year we will be able to win a title, we will always try for that."